It certainly lived up to those sentiments as a zombie plague is running rampant in London, but that is a bit of a fake-out as the zombies or Revenants as Mann likes to call them is more of a B story line at best. I've long been a fan of steampunk and The Affinity Bridge brings the steam in spades. If H.G. Wells and Arthur Conan Doyle somehow worked out the science and had a son it would probably have been George Mann. 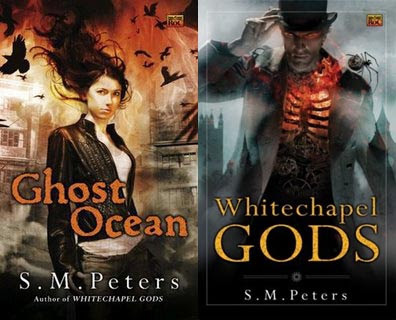 There are clockwork automatons, airships, ghosts, mad scientists, and spades of other things in this entirely strange Victorian setting Mann has concocted. The Affinity Bridge is very much an homage to Doyle's Sherlock Holmes style while still very approachable for modern tastes. The main characters start off very stuffy, but as the work progresses I found many layers yet to be revealed. Newbury has demons that I was yearning for Mann to set free, but alas he is holding out on us. I thought his female assistant Hobbes was a bit one dimensional until something that happened at the very end, which made me question her purpose and skills. Newbury is investigating a series of mysterious murders when he is called away by Queen Victoria to look into an airship crash. The Queen is being kept alive by means of technology, which was intriguing. The dialogue flows well and there is plenty of good action as Newbury battles Revenants, Automatons, and even a few other things. However, some of the solutions to the mysteries do present themselves to Newbury a bit too easily on more than one occasion, but his body does pay the cost for that ease time and time again. I also worked out the big connections fairly early on, but it didn't ruin the experience at all. The Affinity Bridge is sheer fun and will keep you pushing forward to see how the investigative team of Charles Newbury and Victoria Hobbes solves the mysteries. I give The Affinity Bridge 7.25 out of 10 Hats. The series is expected to be at least 6 books long so it makes me wonder if Mann has an over arcing theme in mind for the rest of the series or if it will merely be more episodic. And just who will be his Moriarty? There were shades of massive intrigue towards the end involving Hobbes that could open this world wide. I'll definitely be checking out future volumes. The 2nd volume The Osiris Ritual is to be released in July in the UK, although no date has been announced from Tor on the US release. Sometime next year Mann will release Ghost of Manhattan in the UK as well, which judging by the description is set in the same world as The Affinity Bridge, but not with the main characters from the series. 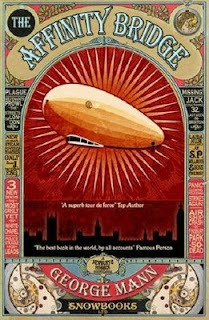 New info thanks to Lou Anders @ Pyr: Ghosts of Manhattan will be released in the US April 2010 by Pyr. I find the US and the UK covers brilliantly detailed and beautifully illustrated. You have to take a look at it up close to appreciate all the little embellishments on both. There is also a free short story called The Shattered Teacup set in the same world, but before the events of The Affinity Bridge available as an: eBook or as an audio book from Snowbooks the UK publisher of the series. Also, I just ordered a signed limited edition of The Angel's Game by Carlos Ruiz Zafon from Random House. Most people don't even realize they have a program such as this running. Check it out here. These editions are the regular first printing but they come with an autograph page which is also numbered. They are usually limited to under 100 copies, but in the case of The Angel's Game it is only 50 copies. A letter of authenticity is included as well from Random House. Similar editions of World War Z by Max Brooks and The Dresden Files: Storm Front Vol. 1 graphic novel are available amongst a few others. Add on from comments: Almost forgot. 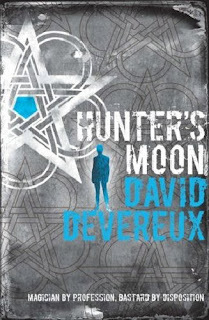 To get free shipping from Random House enter SHIPPING in the promo code section when checking out. I picked The Magicians up on my trip to BEA this year. I hadn't heard anything about it previously, but that is what BEA is supposed to be about. To find those gems you might not otherwise have come upon and The Magician is one of those gems. 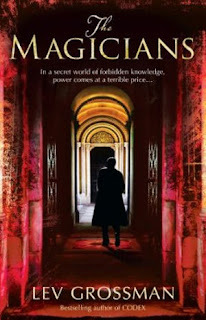 The Magicians is a pastiche of The Once and Future King, The Chronicles of Narnia along with the Harry Potter novels only aimed at adults. I read Lev Grossman's Codex a couple years ago and was severely underwhelmed so when I started The Magicians the bar was set fairly low. Having said that it is a truly magical and entertaining read, but make no mistakes this is not a book for children. Instead of very young people learning magic or getting involved in fanciful worlds his characters are college aged and in most cases very flawed. The Magicians deals with what people have to go through in order to learn magic properly and the consequences of getting involved with this world. What if you could do anything you wanted? Or go anywhere? What would you life mean? Those are the questions Grossman posits as you journey with Quentin Coldwater on his quest to become a magician and his obsession with Fillory and Further, a thinly veiled Narnia series he is infatuated with. There are sexual indiscretions and many morally questionable situations as the character make their way through the world. There is a good amount of action although most takes place in the last 1/4 of the book. Yet the book flows easily as I kept wanting to know what was next. The story starts with Quentin getting invited to take an entrance exam to a magic school very mysteriously. Brakebills, is a very exclusive school for people who show a high aptitude for magic. This isn't hogwarts. The description of the way the students are taught is more reminiscent of Law School than anything else as most of the work is reading, rote memorization, and repetition of magical exercises. My biggest issue with the book is most of the characters do not develop much as they go along and are a bit dry with personality. One of the most interesting characters, Penny, is missing from a large chunk of the book as if the author forgot about him for 200 pages. However, Penny's disappearance is somewhat haphazardly explained. Once Quentin and his friends graduate from Brakebills and are forced into the real world it is very clear they have no place in it. Eventually Quentin and his friends journey into a world very similar to Narnia, which is a bit too much on the nose for me at times, but it does have its place as all the pieces do fall into place well. They encounter many magical and mythological creatures. A bit more background on the Fillory world would have been nice, but it does get filled in a bit towards the end. A couple of the major treads were a bit predictable, such as the revelation of a missing character from the Fillory series and another related character. Yet these flaws do not take away from the enjoyable reading experience. The ending is fitting and leaves the character open for a succeeding adventure, but gives you closure on pretty much everything. Quentin's final transformation is actually quite interesting and I'm eager to see what other worlds Grossman has in store for him. I give The Magicians 8.5 out of 10 Hats. Grossman has grown quite a bit as a fiction writer and it shows. 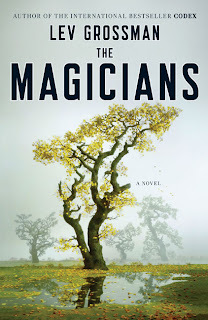 The core audience for The Magicians is probably people who rarely read fantasy or those who want to reminisce a bit about the books they read growing up. 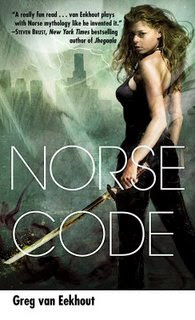 Those who are very well read in the fantasy genre may consider the concepts a bit over done, but Grossman does manage to stand apart and create a world where actions have very definitive repercussions. -3 High-Brow, 3 Violent, 29 Experimental and 17 Cynical! Congratulations! You are Low-Brow, Violent, Experimental and Cynical! These concepts are defined below. Lian Hearn is the pen name used by Australian author Gillian Rubinstein when writing the Tale of the Otori series, beginning with Across the Nightingale Floor (2002). 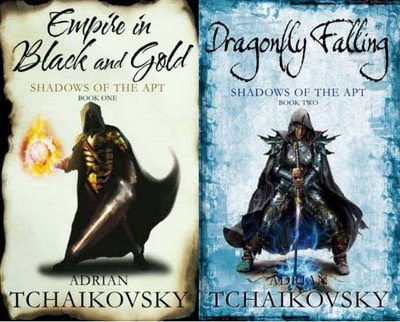 The trilogy (which has spawned a sequel and a prequel) was a great success, becoming bestsellers world-wide and being published in more than thirty countries. Part of the reason for the series' success is probably that it is traditional fantasy but with a twist: The books are set in a country resembling feudal Japan, rather than some vaguely European environment. This setting gives Hearn a great opportunity to explore themes such as war, revenge, power hunger and clashes between cultures, all of which makes for an occasionally very violent tale, where nothing is ever coated in sugar. The books also feature at least one strong and very believable female character. While there have been Japanese-style fantasy written by Westerners earlier (such as the Book of Years series by Peter Morwood), Hearn uses the brilliant technique of describing her world from inside, calling typical Japanese phenomena by generic names rather than exorcising Japanese terms. Thus, swords are called swords, not katanas, we hear of wrestlers and realize that they are sumo wrestlers, characters eat bean curd rather than tofu, etc. All in all, Hearn has successfully expanded the borders of what can be done within the genre, while still writing for a mass audience! You are also a lot like C S Lewis. If you want something more gentle, try Orson Scott Card. If you'd like a challenge, try your exact opposite, Susan Cooper. This is how to interpret your score: Your attitudes have been measured on four different scales, called 1) High-Brow vs. Low-Brow, 2) Violent vs. Peaceful, 3) Experimental vs. Traditional and 4) Cynical vs. Romantic. Imagine that when you were born, you were in a state of innocence, a tabula rasa who would have scored zero on each scale. Since then, a number of circumstances (including genetical, cultural and environmental factors) have pushed you towards either end of these scales. If you're at 45 or -45 you would be almost entirely cynical, low-brow or whatever. The closer to zero you are, the less extreme your attitude. However, you should always be more of either (eg more romantic than cynical). Please note that even though High-Brow, Violent, Experimental and Cynical have positive numbers (1 through 45) and their opposites negative numbers (-1 through -45), this doesn't mean that either quality is better. All attitudes have their positive and negative sides, as explained below. You received -3 points, making you more Low-Brow than High-Brow. Being high-browed in this context refers to being more fascinated with the sort of art that critics and scholars tend to favour, while a typical low-brow would favour the best-selling kind. At their best, low-brows are honest enough to read what they like, regardless of what "experts" and academics say is good for them. At their worst, they are more likely to read what their neighbours like than what they would choose themselves. You received 3 points, making you more Violent than Peaceful. Please note that violent in this context does not mean that you, personally, are prone to violence. This scale is a measurement of a) if you are tolerant to violence in fiction and b) whether you see violence as a means that can be used to achieve a good end. If you are, and you do, then you are violent as defined here. At their best, violent people are the heroes who don't hesitate to stop the villain threatening innocents by means of a good kick. At their worst, they are the villains themselves. You received 29 points, making you more Experimental than Traditional. Your position on this scale indicates if you're more likely to seek out the new and unexpected or if you are more comfortable with the familiar, especially in regards to culture. Note that traditional as defined here does not equal conservative, in the political sense. At their best, experimental people are the ones who show humanity the way forward. At their worst, they provoke for the sake of provocation only. You received 17 points, making you more Cynical than Romantic. Your position on this scale indicates if you are more likely to be wary, suspicious and skeptical to people around you and the world at large, or if you are more likely to believe in grand schemes, happy endings and the basic goodness of humankind. It is by far the most vaguely defined scale, which is why you'll find the sentence "you are also a lot like x" above. If you feel that your position on this scale is wrong, then you are probably more like author x. At their best, cynical people are able to see through lies and spot crucial flaws in plans and schemes. At their worst, they are overly negative, bringing everybody else down. "I almost hate to say anything here, for fear of jinxing it... but for what it's worth, the last six weeks or so have been the most productive period I've had on A DANCE WITH DRAGONS in... well... a year at least, maybe several." He has miss his self-imposed deadline of the start of June to ensure an October publication, but this is still wonderful news that he is getting there. I'll still keep pushing back my re-read of A Song of Fire Ice until he says the manuscript is off to his Publisher though. 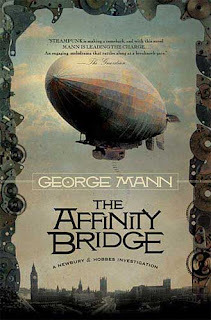 Also, I'm about a third of the way through The Affinity Bridge by George Mann. Very good stuff so far. It is actually a high quality fake trailer. I love the use of Nathan Fillion as Hal Jordan. He definitely has the right attitude to pull it off, although he might make a better Guy Gardner if he had red hair. We won't be seeing the real movie until 2011 at the earliest though. We'll have to make due with this. Don't you love people who have too much time on their hands? Pyr just announced the good news on their blog. I'm glad to see Tchaikovsky series find such a good home with Pyr. Now I'll definitely have to give them a chance. I admired the covers a lot to the point I almost ordered them from the UK. Well now we can support Pyr. Again Pyr is releasing the first 3 quickly, which I have to laud them for. Absolutely gorgeous. I love the image and the coloration and the fact the type is not a dominating factor. I've been a fan of Sawyer's for a number of years. His Calculating God is one of my favorite SF reads of all time. As readers of this blog know Sawyer's novel Flash Forward has been adapted by ABC as a series set to premiere this fall. I usually wait until Sawyer completes a series before picking them up though so it may be awhile on WWW. 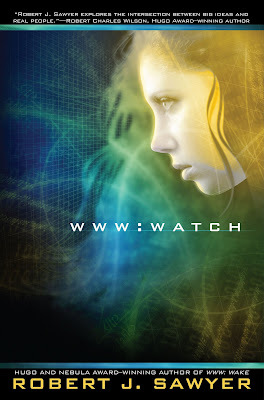 Watch (Book 1) was released about 2 months ago with a striking cover as well. 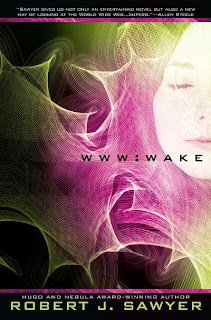 Wake is schedule for April 2010 and the last Wonder is set for 2011. 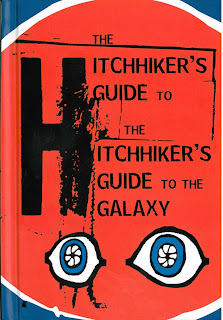 I picked The Hitchhiker's Guide to the Hitchhiker's Guide to the Galaxy on my BEA jaunt. I 've actually been meaning to get this for awhile. It only took 3 requests including one from ZZ9 Plural Z Alpha, the Official Hitchhiker's Guide to the Galaxy Appreciation Society to finally get me to do it. When an appreciation society comes a knocking you better answer lest you have the whole society gunning for you. I honestly had no idea there was a society dedicated to Hitchhiker, but I wasn't too surprised as it is a series certainly worthy of one and as we all know those Brits were crazy enough to produce Douglas Adams. This is more of a description than a review since this is a hard to find book and there is honestly not much to review. The Hitchhiker's Guide to the Hitchhiker's Guide to the Galaxy was described to me by the publisher as the DVD extras of the series. I was a little disheartened when she told me as I was hoping for a sample copy of And Another Thing or at least a chap book, but alas Hyperion is trying to keep a tight lid on the contents. Basically The Hitchhiker's Guide to the Hitchhiker's Guide to the Galaxy is a promo piece to get bookstores and other accounts who don't know much about the series to update themselves. It also acts as a reminder about the series itself as it has been more than a decade and a half since the last book in the series came out. It's very slim 64-page small hardcover book printed in 2 colors (black & red) without a jacket as the cover is printed textbook style with the type done in spot gloss. The format is quite whimsical since the text is a bit scant. 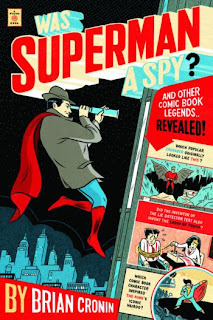 Pages 1-16 is a nice synopsis of the series by Eoin Colfer titled So Far As We Know. The next section gives four pages over to each book, which consists of one page for the title of the book, one page for a paragraph description, and two pages each with a quote from each book. The third section is a glossary of characters, devices, and important facts. The last section titled A Brief History of The Hitchhiker's Guide to the Galaxy is a 4 page description of the impact and products involved with the series. My guess to some of the material will start of And Another Thing and some will be used in the back such as the glossary. I can't really give something like this a rating, but I can tell you I am glad to add it to my collection just because I am something of a completest and this is certainly a collectible. I doubt there are 5,000 copies of it in print. Probably a lot less than that given even big publishers print less than that for galleys and promo pieces. This will sit proudly next to my Subterranean Press limited edition novellas. 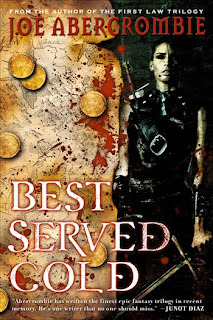 Best Served Cold has to be the most anticipated Fantasy read this year. As soon as I got my greedy hands on it I just had to start. All the fervor over the cover design doesn't matter in the end. It is the pages between the cover that counts and that is truly entertaining. Abercrombie is building on the world he started with The First Law Trilogy although centering it on parts not visited prior, namely and it related nations. Yet it differs from First Law in that it is a much more personal story. He does include a couple minor characters from First Law although they grow much from what they start as. As the title suggests revenge is the driving force. Monza Murcatto is Grand Duke Orso's most trusted general who has won him many battles, but now he feels she has become to popular and will try to usurp him. Orso has Monza's brother Benna killed and nearly her as well in an incredibly detailed account of her literal fall from his graces. After Monza heals (partially) she begins gathering a group to help get revenge upon those who killed her brother. Abercrombie has done a superb job creating another stellar cast of characters you just love to hate and hate to love along with the most gritty action that could be wanted. Surprisingly, I found the most redeemable character in Friendly, who is a cold blooded killer with an utter fascination for numbers. Although unlike most of the other characters he is very straight forward with his dealings and is perhaps left the most untwisted in the end. Abercrombie still manages a fine balance of well realized characters, believable dialogue with a detailed world while also masterly offering twists and turns to the plot and characters. 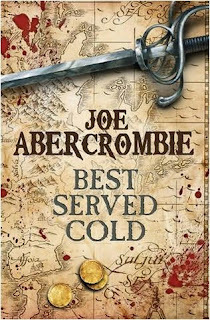 Abercrombie has been known to do some vile things to and with his characters and he certainly rides the edge just enough not to turn most readers off with some of his characters predilections most notably involving Monza and her brother's past as well as a certain Duke's sexual interests. Having said that this is definitely not a book for the prudish or squeamish. Overall, I found the style and format very similar to Lynch's The Lies of Locke Lamora. It is very much a series of capers; however the goals don't involve money, but rather killing. Only the characters aren't lovable rogues (except Cosca) like in TLoLL, but rather some of the most notorious murderers and back-stabbers in the world. Have no doubts that Abercrombie is still cruel to his characters. If anything he does worse to them here than in First Law. There are no happy endings in an Abercrombie book and there never should be. Best Served Cold is meant as a standalone and newcomers will definitely find it open enough without having read prior volumes yet fans of First Law will be reward for their knowledge of the world and appreciate the little things and some surprise appearances from other characters. I give Best Served Cold 9 out of 10 Hats. Abercrombie has left a few holes open and secrets unrevealed that are sure to pop up in his next novel of the First Law world and I'll be there for it. Abercrombie has once again proven why he is an award-winning author. (almost) Final Cover for Joe Abercrombie's The Heroes now with Blood! Starting in mid-2010 we will have all-new episodes of FUTURAMA to enjoy on Comedy Central. This goes to show that Fox doesn't really know what they are doing. FUTURAMA was definitely canceled before their time so I'm sure the creators have plenty of material to go with. Unlike The Simpson which should really hang it up before they totally tarnish themselves as they are just about there. If you haven't checked out the FUTURAMA movies give yourself a treat and do so. I'd recommend starting with Bender's Big Score. NEW YORK, June 10, 2009 -- 20th Century Fox Television, the animation powerhouse that brought "Family Guy" back from the dead five years ago, has done it again: Matt Groening and David X. Cohen's brilliantly subversive animated sci-fi comedy "Futurama" will return to production on 26 new half-hour episodes more than six years after the series aired its last original episode. 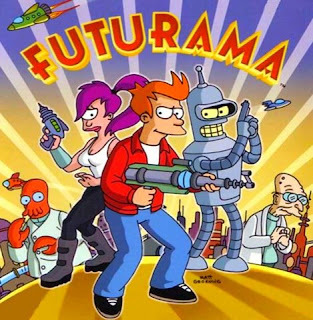 "Futurama" was a staple of Fox's Sunday night animation block from 1999 to 2003 before ceasing production on original episodes. In June 2006, COMEDY CENTRAL acquired the rights to the existing 72 episodes of the series, which the channel began airing in January 2008, and four recently-produced extended length "Futurama" adventures: "Bender's Big Score," "The Beast with a Billion Backs," "Bender's Game" and "Into the Wild Green Yonder," which enjoyed enormous success both on COMEDY CENTRAL and in DVD release. This new deal marks the show's return to episodic series production on original episodes. "Futurama" becomes only the second series in the history of the medium to go back into production based on the strength of its DVD sales and repeat airings on cable. The new episodes will be available in mid 2010 to be shown on COMEDY CENTRAL. Twentieth Century Fox Television retains the option to license the original runs of the new episodes to a broadcast network. Quipped Matt Groening, "We're thrilled 'Futurama' is coming back. We now have only 25,766 episodes to make before we catch up with Bender and Fry in the year 3000." Added David X. Cohen, "We're excited and amazed that the show is coming back, perhaps due to some sort of mysterious time loop. We look forward to working with COMEDY CENTRAL and 20th Television to make this the best iteration of the loop yet!" "When we brought back 'Family Guy' several years ago, everyone said that it was a once-in-a-lifetime thing - that canceled series stay canceled and cannot be revived," commented 20th Century Fox TV Chairmen Gary Newman and Dana Walden. "But 'Futurama' was another series that fans simply demanded we bring back, and we couldn't have been happier when Matt and David agreed that there were many more stories yet to tell." What Author Haven't You Read But Should? Or What is Your Greatest Shame? A little while back I was following a post and comments at Tor about What Books Haven't You Read? The post mostly got involved with classics people tried but couldn't get through. I'd like to repurpose the question to "What Author Haven't You Read, But Know You Should?" This could include more modern authors, but try to leave out anything newish like debut authors of the last year or so such as Patrick Rothfuss or Joe Abercrombie. It should be authors you've been recommended or thought about reading multiple times. Please list the top 2 authors you have criminally missed or ignored in the Speculative Fiction arena and try to give a reason. Try to refrain from trouncing on people for their misses as they are at least admitting them and maybe this will inspire them to rectify the situation. 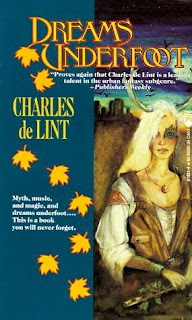 Charles de Lint: I've been reading online for years about how much of an influence de Lint was on Urban Fantasy and Neil Gaiman in particular. You'd think those reasons alone would be enough to get me off my duff. I haven't read him because for quite sometime I just kept forgetting his name when I was in a bookstore. Finally when I had it down I couldn't figure out where to start. I'd be flipping through the books on the shelves and not know which was a series or standalone since de Lint has a habit of using the same characters in a lot of books. Most people say start with Newford, but which? The short story collections? The standalones? Since the Newford series is with a couple different publishers and many books have a lot of editions which makes it difficult to tell what order they should be read in. I hope to rectify the situation soon as I picked up Dreams Underfoot and Memory & Dream from the Newford series in a used book shop just last week. 2 books for $7 was hard to turn down. 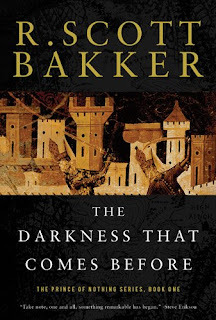 R. Scott Bakker: I don't have a clear reason for not trying The Prince of Nothing series. Maybe because it is one of those series I've heard you love or completely hate. I've heard them called literary fantasy, which might have turned me off. However, I do enjoy literary fantasy so again not a good excuse. I've also been told they are bleak and sometimes I'm just not in the mood for that type of thing. I always associate bleak with depressing and usually shy away yet I have made many, many exceptions. I don't really care for the covers on Overlook's new editions though. Maybe I'll give them a shot later in the year. 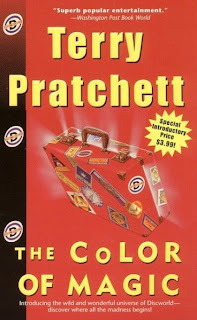 Terry Pratchett: I include Pratchett only in regards to the Disc World series. I've actually read Nation, The Carpet People, and The Bromeliad Trilogy all of which I enjoyed thoroughly. Long have I been told to read Disc World, but I haven't wanted to get involved with a 30+ long series. Knowing me I'd want to read them all straight through if I started and also knowing me I'd want to buy them all. I'll probably read them someday. Maybe even in the next couple of years, but for now it will have to wait as my shelves are already overburdened with unread books as is. Some smaller shames: Terry Brooks could have been on the list as well, but I honestly don't think I am missing anything. I tried to read the first Shannara book when I was a teen and just didn't care at all. I picked William Gibson's Neuromancer up while reading Snow Crash and summarily lost interest with cyberpunk because I don't think it could be done better than Stephenson. Neuromancer has now been sitting on my shelf for quite a few years and probably will for a few more. Gene Wolfe is another I should get to at some point although I have read and enjoyed his short fiction from time to time. OPINION | What Kind of Connections Do You Make With Books? Or why I didn't want to buy it online? While wandering around Manhattan this weekend I happened across this bar: It was just too perfect and I had to take a picture. 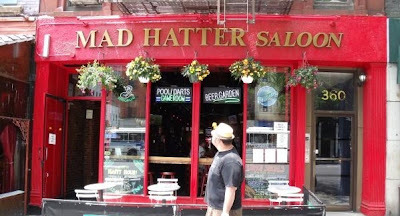 Check out Mad Hatter Saloon next time you are traipsing about in NYC. Check it out here as I can't seem to embed the file. Regardless the video is tiny, but the audio is good. The speech is not that different from what we've heard before, but it does add a little detail into Tor's decision behind Brandon Sanderson.